Now available from Winterberry Press! 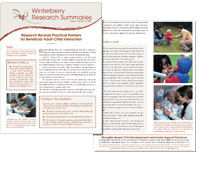 Visit Winterberry Press to order digital or hard copy versions of all RTC materials. All of the links below will take you to the current version . Carl J. Dunst, Ph.D., Andrea J. Storck, B.S., Melanie D. Hutto, Ph.D., & Donna Snyder, B.A. Melinda Raab, Ph.D., & Carl J. Dunst, Ph.D.
Tracy Masiello, Ph.D., & Lauren Tucker, B.A. Carl J. Dunst, Ph.D., Andrea Stork, B.S., & Donna Snyder, B.A. Danielle Z. Kassow, Ph.D., & Carl J. Dunst, Ph.D.
Tracy Masiello, Ph.D., & Jennifer Pace, B.A. Carl J. Dunst, Ph.D., & Danielle Z. Kassow, Ph.D.
Pamela Rolandelli, Ph.D., & Carl J. Dunst, Ph.D.
Saddle up, but . . .
¡Éxito! ¿Cómo afecta el Pivotal Response Training (PRT) a los niños pequeños con autismo?